Half tuck is great for cool girls, but a tucked-in shirt is more sophisticated to do if you want to look like a grown-up women. Upgrade your look with a minimal denim top instead of wearing a jean jacket to get a sophisticated look. Be sure that your outfit is not going overboard. Wear a playful back with an understated silk suit and heels. A beautiful A-line skirt for your grown-up look. Make the color pop with a bright, bold color and balance it with neutral color to elevate your outfit. To elevate your look, all you need to do is just fully buttoned your shirt. A simple yet bring a different look to your outfit look. There’s something about subdued colors that make us feel wise and confident. So skip bright colors and just come up with neutral colors to look like a grown-up women. Accessories is all you need to complement your look. And it also distributing one color throughout your look reads polished. There are 2 words to describe the grown-up look; less is more. Wear a white shirt, jeans and heels is still can make you look sophisticated. 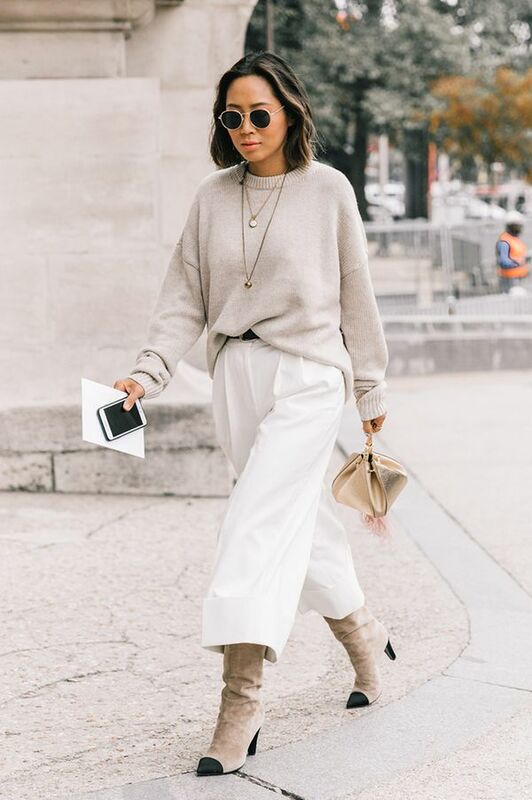 For example, if you prefer less form-fitted outfit, tucking in your oversize sweater to accentuate your waist. Or opting for a cropped version of wide-leg trousers.